Mildred Pierce is a true masterpiece. The title character has an iron will, which is completely neutralized by her overwhelming maternal instinct to unconditionally love and provide for her children. But because so many of the people she surrounds herslf with belittle her, she does not realize her own worth. Her desire for the good opinion and affection of those who scorn her is her one flaw. It makes an otherwise strong woman vulnerable. And this vulnerability leads her to make bad choices. Over and over, she is humbled, mocked, scorned and riduculed, overtly by her own daughter, and less obviously by her boyfriend. Yet despite it all, she manages to start a business during the Great Depression which pulls her out of poverty to give a better life to the one person in her life who is least deserving of it. She is entirely too human. Any woman could find herself in the same situation, and given the same circumstances, many women (including myself) would likely make the same ill-advised choices. 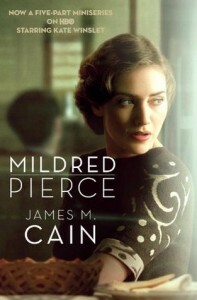 For me, the mark of an exceptional book is one I can't stop thinking about after I've finished it, and this is most certainly true of Mildred Pierce . . . Did Mildred regret remarrying Bert after the reason for doing so ceased to exist? I got the distinct impression that she didn't really love Bert, or Monty for that matter. She felt affection for Bert, and physical attraction to Monty, but did she really want to be with either one of them? And assuming that Veda kicked Monty to the curb as soon as she found herself a rich man (or got tired of him spending her money), would Monty feel remorseful about how he treated Mildred? If he had come knocking on her door, either to apologize or attempt to reconcile, would Mildred have given him opportunity to speak? I suspect she would have, because she really didn't have it in her snub someone who appeared penitent (how many times did Veda take advantage of Mildred's compassion). Without doubt, Mildred would have given Veda another chance, despite her declaration that she not come back at the end of the novel.